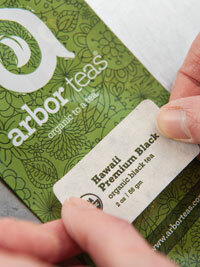 Welcome to a guided tour of Arbor Teas' packaging! We are proud to be the first and only company offering our full line of loose teas in backyard compostable packaging. Our innovative backyard compostable packaging uses a cellulose film derived from wood pulp sourced from sustainably managed trees. The thin, lightweight material allows it to break down quickly (even in home compost heaps! ), and adds practically no weight during shipping. Our labels are composed of hemp-based or sugar cane-based paper. The sugar cane fibers are collected from sugarcane waste, thereby diverting waste from landfills to paper production. They're adhered with an innovative compostable adhesive that is vegan and meets the requirements of DIN CERTCO and BPI for biodegradability and compostability, in addition to being compliant with the ASTM D6868 - an industry first! We're happy to offer simple instructions for making hot-brewed tea, iced tea, and cold brew on the righthand panel of the package. But don't forget - tea preparation is a matter of personal taste, so feel free to experiment! The back of the package features a handy reminder to transfer your tea to a permanent container and compost the package. You can also find our address here, in case you want to be our pen pal! The back label of every package offers a full list of ingredients as well as our recommendations for preparation including: recommended water temperature, quantity, and brewing time per 8 oz cup. Again, consider these guidelines as a starting point on your journey toward the perfect cup! Rest assured that every single one of our teas and herbs is Certified Organic under the USDA National Organic Program (NOP). When you choose Arbor Teas, you support a sustainable, no-waste alternative that allows you to compost your used tea leaves AND the packaging, leaving only a delicious memory behind! We recommend transferring your tea to a permanent, air-tight container once opened - it'll stay fresher that way. After you do, don’t forget to compost the package where ever composting takes place - even in your backyard! We hope you’ve enjoyed this tour of our packaging. 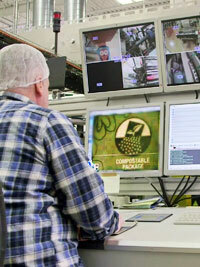 Watch the video below to get a behind the scenes look at our compostable packaging journey, and hear from our partners. On Earth Day 2010, Arbor Teas became the first tea company in the United States to deliver a full line of organic loose teas in backyard compostable packaging! With the release of this next-generation packaging, we at Arbor Teas advanced our environmental mission, continuing to lead the tea industry through our staunch commitment to sustainable business practices. For the first time ever, tea drinkers were able to compost their tea leaves AND tea packaging together in their home composting system! The body of our packaging is composed of a cellulose film made from wood pulp sourced from sustainably managed, non-GMO trees. Most of the compostable packaging available in today’s marketplace is only truly compostable in industrial settings optimized for rapid breakdown. 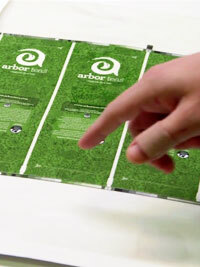 By contrast, the film used for Arbor Teas’ new packaging can actually break down in a backyard compost setting. Because of greater variation in moisture and temperature, backyard composting environments have historically been incapable of breaking down so-called “compostable” packaging materials, such as corn-based plastic cups and take-out containers. However, the material in Arbor Teas’ packages requires a less optimized environment for biodegradation, representing a major advance in low-impact packaging. The film is certified to both the European (EN13432) and American (ASTM D6400) standards for compostable packaging, and has been submitted to an additional independent test protocol (Miti Test ISO14851) confirming its biodegradation at ambient temperatures and in aqueous environments, relevant for home composting in bins or compost heaps. Not only are our packages compostable, they’re also lighter than the Arbor Teas’ predecessors (paperboard tube and kraft bag) and lighter than many other options on the market. Overall, we were able to reduce the weight of our packaging materials by more than 60%! This translates to a meaningful reduction in the carbon footprint of Arbor Teas’ operations. And, in response to customer requests, this packaging also accommodates more tea . On average, Arbor Teas packages contain 27% more tea than they did previously. The result: MORE TEA, LESS PACKAGING! **Prior to 2015, Arbor Teas used a removable paper tag adhered with a stretchy band to identify each tea in the compostable packing. This original label was not ideal, as customers could neither compost nor recycle the entire label. So, why did we use it? Because, unfortunately, there was no compostable adhesive available on the market prior to 2015. As a result, any label affixed to the compostable package would have rendered it non-compostable. At Arbor Teas, we never stop improving our environmental performance, and we hope you'll join us in doing the same. Click below to learn more about our sustainability initiatives, understand sustainability issues related to tea, and minimize your impact at home with our eco-friendly brewing tips.